The Lopez Island House will be featured on the 11th annual home tour, hosted by the Lopez Island Center for Community & the Arts. The original design and permitting happened while I was a Project Manager at D+A Studio. AKH finished the permitting process, construction administration, and worked closely with the clients on the interior design and with the contractor, KDL Builders. It was so great working with the clients on this house, and I’m so excited that it will be on this home tour! Speaking as someone who doesn’t have a yard (and would love the extra space), most yards I see are underutilized. Most people have this expanse of space behind their house that can be used much of the year. By programming outdoor space, we add to the amount of square footage of living area we can enjoy. OK, OK, it’s probably freezing outside right now, but what better time to dream about wonderful outdoor spaces? The most obvious and ideal solution is to create a glassed-in porch on an existing slab or under an existing roof (bonus is it’s on the south side of the house, in an area like ours). Many activities can spill over to this room. A great solution is to use a sun porch as a combination play room/reading nook/guest room. Yes, guest room. Most of the year, Seattle weather is ideal for sleeping, and the coldest of nights can be aided by an inexpensive space heater. A day bed is ideal for reading or homework during the day and guests at night. A day bed can function as a guest bed and reading couch. Next to a dining or card table, it also serves as seating for little ones. Hillsdale House Redding Day Bed and Trundle. One way to spend more time outside is to install a hot tub. Hot tubs can be intimidating because of the maintenance cost, but in climates like ours, this can be worth it, especially considering that they can be used all year long. A hot tub can be a great social draw and a way to get to know neighbors. A great outdoor space can be enhanced by a hot tub. Prodigy by the Olympic Hot Tub Company. Read about their commitment to Energy Efficiency. Greg Kossow, a carpenter based in Port Townsend, WA, published an article in Mother Earth News on How to Build a Hot Tub for less than $1,000. If you don’t have an existing space to make into a glassed in porch, enclose a space as much as possible to hold in heat, protect from weather, contain noise, and maximize privacy (be sure to comply with any relevant setbacks for your yard, if it’s something permanent). Line the space with a grill, outdoor seating, outdoor furniture, and container plants. Place an outdoor fireplace in the middle. Also, a very simple and inexpensive touch is to add small white Christmas lights . There is something about those little white lights that dress up and define a space, and make any time you spend in your outdoor space feel special. Chili pepper lights also work for a more festive setup. In my opinion, the biggest waste of space in our suburban neighborhoods is the front yard. Most of us don’t spend much time there, except when we are working on it. You can get more out of your outdoor square footage by maximizing the outdoor room potential and programmed space in your backyard, and moving the garden to the front yard. Many think that vegetable gardens are not attractive, but they can be easily lined with a rockery, railroad ties, ornamental plants, or containers. If your front yard is small, pots or a rockery will keep passing dogs away from your edibles. But, be careful–front yard gardens may be illegal in your municipality or HOA. For a great overview of the battle over front yard gardens, see the NYT piece “The Battlefront in the Front Yard” and “Fight for the Right to Grow Food: Orlando Man Cited for Illegal Gardening” in Mother Earth News. A cute hutch like this one from JCP Home (Lindale Buffet and Hutch) would be just as comfortable on a porch as a home for garden supplies. If you have an outdoor covered porch, why not take advantage of the space for extra storage? You don’t have to look like a hillbilly to do this. Choose attractive cabinets or wardrobes. 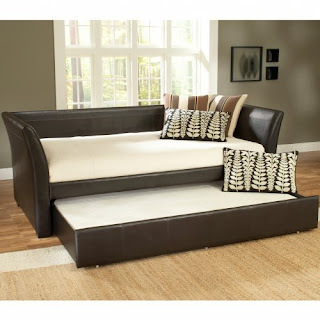 Look for well built used furniture on Craigslist or used furniture stores. A buffet, credenza, hutch, or china cabinet can be painted bright colors and used to store gardening supplies, camping or other outdoor equipment, sporting goods, or as an outdoor wine cellar. Place ornamental plants on any surfaces and surround the furniture with container plants, so it looks at home in the outdoors. Programming outdoor space has the added bonus of taking away the inefficient lawn, eliminating the need for watering, mowing and weed control. One of the things I’m most passionate about in design and in my own reading and writing is sharing spaces and items. A great summary and update of the sharing movement, “The New Sharing Economy: A Study by Latitude in Collaboration with Shareable Magazine) can be found here (warning, it’s a PDF, but well worth opening), from the online magazine Shareable: Sharing by Design. DIY Home Adaptation has been about thinking of your space in a different way and utilizing it the way that works best for you, not just how the rooms are labeled on a floor plan. Simplifying your home to include only what you need can open up space and possibilities. This idea for setting up for sharing space fits in multiple categories under the Adaptable//Sustainable banner: casual cohousing, DIY home adaptation and grassroots retrofits. One room with so much possibility for sharing is a garage. Unless you live in place with very harsh winters, do your cars really need a bigger room than your bedroom? The area of a two car garage can be 25% of the average home. Along with ear plugs and headphones, one of the cheapest ways to “remodel” your house is to purchase a remote keyless entry , which you can do for under $50, to start your car from inside the house on a cold day. For under $200, you can purchase a storage shed for the backyard to hold outdoor and sports gear. A garage is an ideal place for a shared community office. It’s private and separated from the rest of the house, usually with its own entry. The ideal situation would be to have a powder room close by in the house. No one can agree on the temperature in an office anyway, so personal fans and space heaters can be used in lieu of central heat and air. Getting a garage in shape for an office will take some work, but not a full on remodel-some insulation in the walls, drywall and paint. Add sweat equity from those who will be sharing the office, and you can do it in a weekend (and as soon as a phone line can be hooked up). More and more people are working from home, and having a shared community office offers many of the advantages of working from home without many of the disadvantages, the main one (in my opinion) being isolation. Internet connection, phone lines (a business line can be a huge expense for small businesses), printers, scanner, fax machine and office supplies (ordering in bulk cheaply), and conference table can all be shared. Also, very small businesses can share an admin person that they may not otherwise be able to afford. The advantages of working from home are in tact: no commute (except a walk to the neighbor’s house), casual working environment, flexibility, saving money on commercial rent. As with most sharing solutions, there are many possibilities of how to handle the financial aspect. This could be a great way for the homeowner to earn some extra income from rent, and it would still be more affordable than standard office space for the other participants. A co-op could be formed among members, and one person could offer their garage as neighborhood storage for shared items such as tools, or as a neighborhood workshop. These ideas can of course be applied to other rooms besides the garage, the most ideal being a rarely-used formal living or dining space, usually ideally located at the front of the house by the entry way. Superbia! 31 Ways to Create Sustainable Neighborhoods , by Dan Chiras and Dave Wann. You can read my review of this book here. The Sharing Solution , by Janelle Orsi and Emily Doskow, both lawyers. This book gives practical advice on sharing everything from cars to houses. More and more people are working from home. Even if no one in your house works from home, chances are you need a space to pay bills, check the internet, and store records. Thinking of an office as a space rather than a room save you from designating an entire bedroom or using your extra living area as an office. Below are some ideas to fit an office into an existing space. Office under the stairs: This space may currently be an awkward closet or storage area, but it can be a great space to squeeze in an office. It can be open or closed. 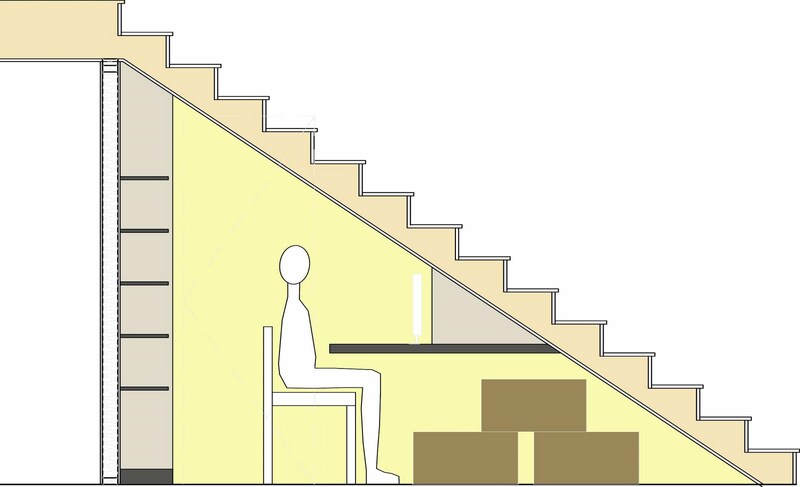 Below is an option for a closed office (the door will open outward and a little bit of the staircase will be exposed). Office under a staircase in a home with typical 8′ ceilings. 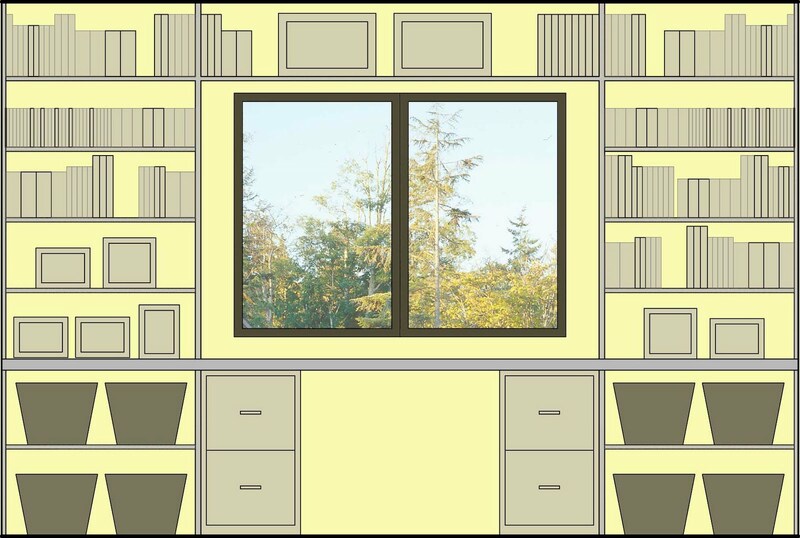 There is room for a bookshelf and a simple desk (use an old door or plywood, cut to fit the 3′ clear space, support with 2×4’s attached to studs). Use the space under the desk for extra storage (boxes holding records can double as a footrest) or for the hard drive for a desktop. Paint the walls a pleasant color, and add a mirror to the wall to make the space seem larger. 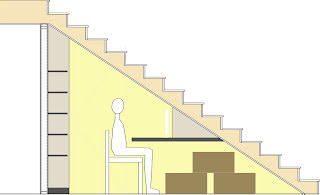 Office at the end of a room: This idea only takes up 2′-3′ of space at the end of a room. In a 12′ room, that’s just 24-36 square feet. You can use a reclaimed hollow core or smooth door, salvaged counter top (my desk growing up was an 8′ section of laminate counter top held up by kitchen table legs), or a few layers of plywood. Short file cabinets can prop up the desk. Run a curtain rod or wire along the edge and use a curtain to hide whatever is going on underneath. Shelves on either end can extend to the ceiling and provide storage for all of the books and DVD’s in the house. 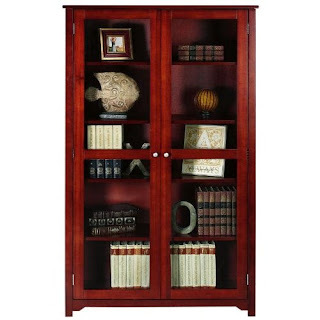 A closed cabinet or glass-door bookcase can be used to hide ugly binders or paperwork. Utilize the end of a room for a desk and floor to ceiling storage. If there is no window, a wire or rod can be hung and large curtain can disguise the area when not in use. 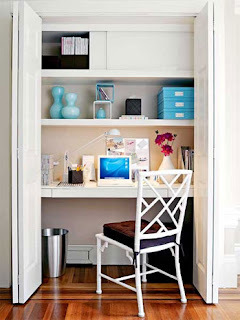 Office in a closet: If you have a guest room or spare room, you can fit a desk in the closet to create an office that can be closed off when guests come or when the room is being utilized otherwise. If you work from home but also have kids to watch, you can put the office in the kids play area and put a mirror behind the computer monitor to keep an eye on them while you work. A deadbolt placed at the top of the drawers will keep them out. The space can then also be used for art projects and craft supplies. Even a small closet can be plenty of room for a computer and shelving. Photo credit. If you live in a small space, your headphones or earplugs can add virtual square footage to your home. Clever design can allow you to have a fully functional office in a small space that can be closed off when you don’t want to be reminded of work. Until I was nine years old, we lived in a small cape cod that was originally two bedrooms with an attic. My parents converted the second bedroom on the first floor to a dining room, and converted the attic into two bedrooms. This meant that the stairs led directly to my little brother’s room, and I had to walk through his room to get to my bedroom. Also, I shared a bedroom all through college. Thus began my bias of thinking: do all kids need their own rooms, especially considering that the grown-ups share a bedroom? I know, I know, it’s easy for me to say this now, I am not a teenage girl or someone who all they wanted growing up was a room of their own. But when considering the cost of buying a new home or adding on just for sleeping space, the parent’s budget may just have to override a kid’s desire for their own room…or should I say, their own drywall box. 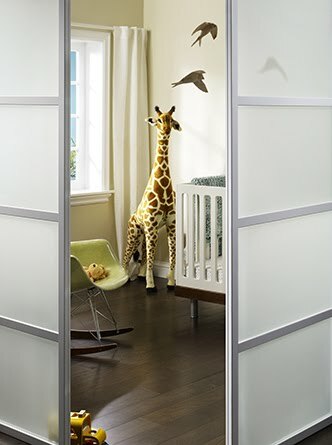 There are many ways to ensure that kids have privacy, even if they have to share sleeping space. 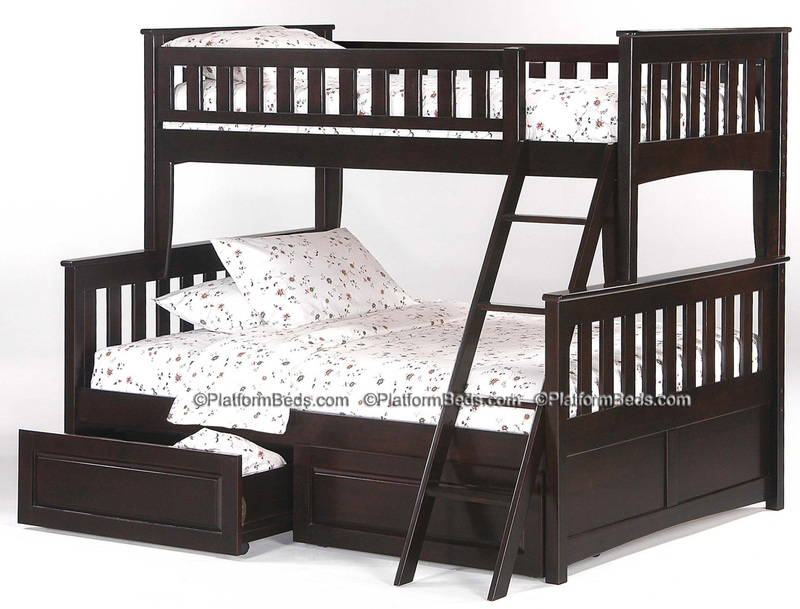 Bunk bed with storage under the Ginger Twin Full bunk bed from Platformbeds.com. One solution is to turn with largest bedroom into the sleeping space, a different way to think of the bedroom. 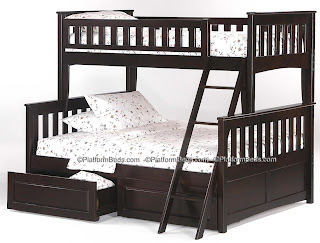 If you have 3 bedrooms and 4 young kids, you can fit two bunk beds into one bedroom. The other bedroom can house wardrobes for extra storage and clothing, desk for computers and can serve as the play area. As the kids get older, the rooms can then be divided by age. Curtains and sliding doors can be added to bunk beds to allow for privacy. Loft beds can house a mini room underneath, with a chair and bookshelf, also made private by curtains or sliding doors (and headphones). 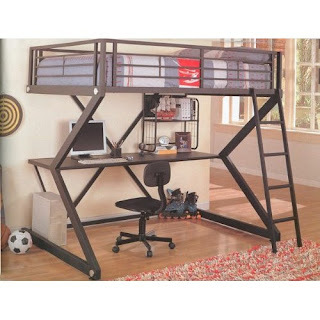 A loft bed like the Ikea Tromso provides space for a desk, chair, bookshelf and or dresser below. The space can be made private by adding a heavy curtain or closing out the bottom with painted plywood and sliding doors. Kids still need their private space. Consider creating some outdoor sanctuaries if your house is feeling cramped. A tree house is of course a classic example for younger kids. Cluster a few chairs under a canopy or in a gazebo, away from but facing the house, to give kids a place to read, talk on the phone or work on a lap top. Texture the yard with gardens, rockeries, or an outdoor water feature to provide noise buffers and privacy. Add an outdoor fireplace and instantly create another space that can be used most of the year. An outdoor fireplace can define an outdoor room or space and give you another room without adding square footage to your house. 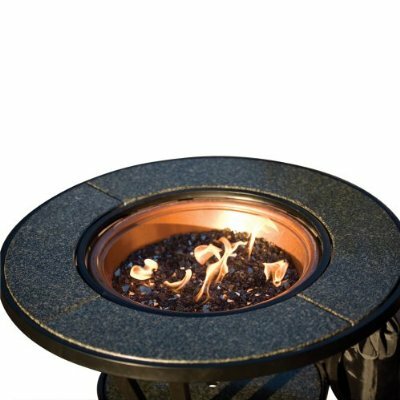 Coleman 5071-700 Ambient Firelight Propane Fireplace and Table . Rooms can also be divided with sliding doors, available from Raydoor or the Sliding Door Company. This route is pricier, but still less expensive than adding a room or relocating. What else do you need in a bedroom? 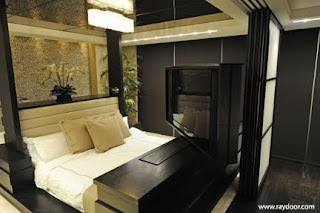 An example of a bed-sized bedroom from Raydoor. Create a bedroom or media area in the corner of a too-large living area, like this example from the Sliding Door Company. With a little creativity, you can avoid a relocation or a remodel for those few years when you need extra bedrooms, particularly when all the kids are living at home. This season of life may only be a small percentage of the time you spend in your home, and then you are left with empty bedrooms that are likely to end up being musty, rarely used guest rooms that you are paying to heat, cool, and furnish. Making a smaller house with less bedrooms work has financial rewards now and in the future. Make use of a formal dining room: do you have two dining areas, one of which is rarely used? Have the formal dining room do double duty as a library. This can help get visual clutter out of other rooms while adding to a room that may need a breath of life. Example of a dining room/library/parlor/circulation space, originally intended to be the living room. The living room is now set up in the smaller, cozier, no traffic original formal dining room. The Royal Bookcase from Dania is formal yet provides ample storage for books and photos. Place antique books and classics in the glass cabinets. Place books that are tattered in the closed cabinets or a storage bin placed on the bottom shelf. 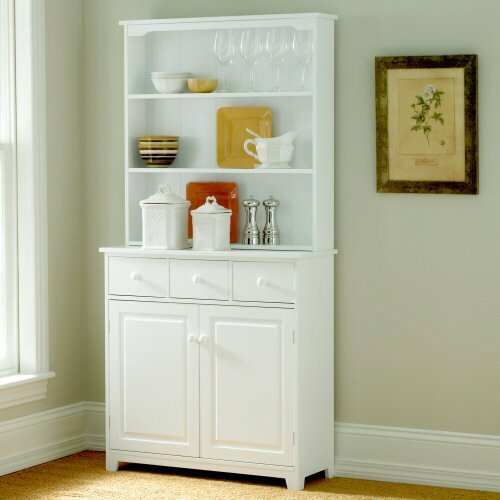 Hide old or unattractive books in a storage bin fit for a formal room. Knos CD box by Ikea can be used for small paperback books. 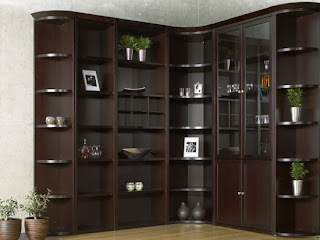 A glass front cabinet keeps the room formal and makes any book or DVD look more attractive. Home Decorator’s Collection Oxford Shelf on Amazon. A snappy yet formal chair like the these Calix chairs from Dania provides a place for reading in your new Dining Room/Library. It can also be placed at the head of the table for dining. 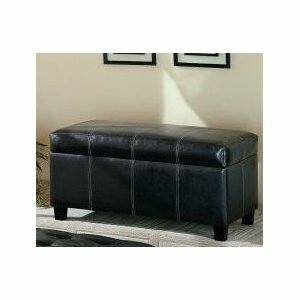 A storage ottoman like this one from Moshya Home Furnishings on Amazon can replace chairs on one or both sides of the dining room table and provides lots of hidden storage. Adding function to a rarely used room will in turn add another room to your house without the hassle of a construction project. Next week: Adaptable//Sustainable: Adding kids’ bedrooms. 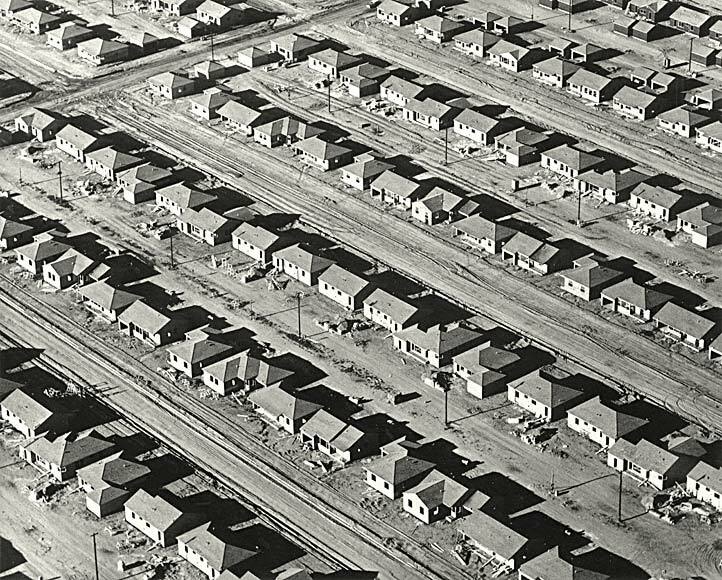 The author, who grew up and still resides in a tract home in Lakewood, CA, makes the ordinary fascinating, looking at the past and present of his city, one of the largest tract home developments of the post-war housing boom. The unique memoir consists of 316 entries, including personal thoughts, facts and figures about the development and how it was built (No sheathing! In California earthquake country! ), and a fascinating look at L.A.’s water situation. It shows that even a seemingly painfully ordinary and banal place can have such a fascinating history. Plaster and Roofing, Lakewood, California, 1950, William A. Garnett. Gelatin silver print. 7 11/16 x 9 9/16 in. © Estate of William A. Garnett – See more of these fascinating images here. “The suburb described in Holy Land depended then-and depends now-on jobs that let men and women with ordinary skills make a living,” says the author. Elites (I am guilty of this too) decry the soul-sucking repetitive conformity of the suburbs. When we were in Europe this summer, people talked about the American suburbs with disdain and asked why they would build such cheap houses out of sticks. But, cheap houses made out of sticks allow people to have houses. Otherwise, it would be the United States of before the baby boom: the average worker could not afford a house within a reasonable distance of a metropolitan area. This book touches on social, economic, geological and environmental factors. It’s not meant to be sentimental, but it made me long for a time I never knew and maybe never really existed, of dads home from work by 5, a rich and engaged civic life, a life of a few very appreciated material things, kids roaming free. This sentiment is almost a cliche at this point, but the cohesion of a neighborhood that existed before we were so “connected” is, I feel, one of the greatest loses of 21st century life. The living room is often hard to rearrange, since the furniture is big and may have some built-in elements, like the fireplace or an entertainment center. Often living and family rooms are larger than we need them to be, if they are mostly used for television viewing. Pull it off the wall: it seems that both living rooms and televisions have been getting bigger. But unless you do aerobic workout videos, there’s no reason for the wide chasm between your TV and couch. Create an intimate sitting area and TV viewing area by pulling the couches and chairs away from the wall and arranging them around the coffee table. Use a rug to define the space. Try some angles: make the new arrangement fresh by turning furniture 45 degrees from the wall. In a living area without a television or fireplace as a focal point, angle the couches and chairs to open up to the window. Move the couch or seating cluster closer to the television, and use the extra space to add a table behind the couch. The table can be used for games, puzzles, homework, laptops, crafts, etc. And, without the wide chasm between the TV and couch, the TV doesn’t need to be so large. On that note, if you have both a family room and a formal dining room, consider switching them. The larger room can serve as the formal dining area, library and parlor/formal living/TV-free area. The smaller room then serves as the smaller family room/TV viewing area. Utilize an underused space: Place a bookshelf behind the couch. Not only will you make use of an underutilized space, when you are sitting on the couch you are facing away from the visual clutter. Dine by the fire: Formal dining in what was meant to be a living room. A large bookcase like the Expedit from Ikea is perfect for placing behind the couch. Books and DVDs are accessible but out of sight when sitting in the living room. Don’t want to let those blocked bottom shelves go to waste? Use them to store rarely used items, like holiday decorations or alternate throw pillows and blankets for changing up colors. If your house or condo was built in the last 10 years, chances are you have an open floor plan, with the kitchen open to the living room. This is great for many reasons: people working in the kitchen are not separated from those hanging out in the living room, the kitchen has replaced the living room as the center of the house, and the kitchen gets plenty of light. Practically, however, this is not always ideal, as there is no way to shut off kitchen noise (like when the dishwasher is running at night when you are trying to watch a movie). 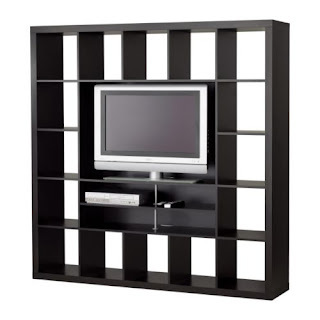 A piece of furniture like the Expedit shelf, shown above, can be placed back to back with an Expedit TV Storage Unit, can serve as a room divider to divide the TV area from the eating area, and should provide enough storage for every book, magazine, and DVD in the house. Add a game room without adding square footage. Really, how often would you use an extra game room or billiards room? Make use of the larger dining room you now have (if you switch the living and dining areas as suggested above) or that large open space if you have one of those open kitchen/dining/living areas. Instead of chairs on one side, use a storage bench to store cards, games and puzzles. 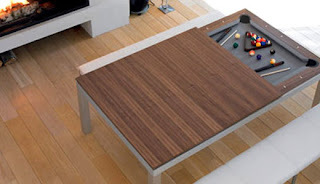 The Fusion Pool Table by Aramith is a clean, modern dining room table that doubles as a pool table. A storage bench in the place of a few kitchen/dining chairs provides seating and storage for games. Modus Furniture on Amazon . We all know that large home theater rooms in spec home McMansions are so 2004. Who wants to pay for 300 square feet with no windows and only one purpose? Create a home theater in the place you are most comfortable, your living room. Invest in some blackout curtains or Roman shades for the windows (which also come in very handy for keeping the house cool in the summer). 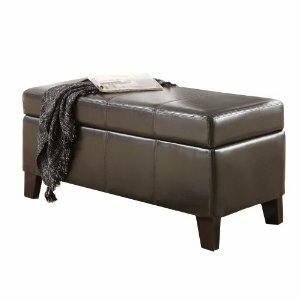 Keep extra pillows and blankets in storage ottoman like the one shown above, and set up the front row of the theater in front of the ottoman. Make sure your living room is working for the way you really live. If not, don’t be afraid to roll up your sleeves and rearrange that large furniture in way that will work for you. Next week: Adaptable//Sustainable: Adding a library to the formal dining room. H2O-Healthy Homes Optimization aims to be one day be the Energy Star of indoor air quality. Cynthia Sullivan-Brown [CEO/Executive Director of A Renewable Earth Nisus] is currently developing the system and spoke about it at the Built Green Conference a few weeks ago. A great idea, but since this particular system is not yet available, why not do your own indoor air quality audit? There is most likely some low hanging fruit in cleaning up your indoor air quality. For more serious issues, you’ll want to call in a professional, like an Industrial Hygienist, to assess the concentration of pollutants. Even small factors can contribute to dangerous indoor air quality (IAQ) can make you sick. Whole house fans that may have been disconnected. Regular ventilation is very important in today’s tighter houses, especially ones that are tight enough to gain a green building certification. Non-toxic interior materials should go hand in hand with tight homes. The plastic or new car smell, which can come with manufactured wood products (and can be terrible in manufactured homes and trailers) and vinyl flooring, for example. Whenever you get any new materials installed, or if you move into a new house, be sure to keep the windows open and ventilate for a few weeks. I may be a little paranoid, but I recommend this for the purchase of new furniture, electronics, and mattresses also. New textiles may have been stored in formaldehyde and should be washed before wearing or using. Keep it dry. Add a ventilation fan if you don’t have one. Shutting off rooms in the winter may seem like a great way to save energy, but in damp climates this can encourage mold growth–not because of the temperature, but because indoor heat is usually dry. If you find your indoor heat is too dry, add a humidifier (or just place a vase of water by the register) but be sure this is not making your home too humid. Run exhaust fans when cooking and after showering. Use fans or open a window when using nail polish remover or other harsh chemicals. Stop using chemicals to clean. (Here is a great guide to getting started from Mommy Greenest) Vinegar and baking soda can be used to clean most things. To avoid the need for harsh chemicals in the kitchen, carefully handle raw meet on a plastic cutting board that can go in the dishwasher, and immediately clean all fruits and veggies–even if you don’t eat the peel, the knife still touches it–right when you get home from the store. Take off shoes when entering the house–this is especially important if you have small children who are all over the floor. Think of all of the pollutants that come into contact with your shoes–and other super yucky things. Avoid using candles or air fresheners, unless you are certain they contain no VOCs. Add a chlorine filter to your shower head. Watch for intake air that may be carrying cigarette smoke, wood smoke, or other pollutants from outside. Dry-cleaning is a necessary evil for some. Before putting newly dry-cleaned clothes in your closet, take off the plastic and let them air out in the bathroom with the ventilation fan running. If your garage is attached to your house, never open the man door to the inside while a car is running. Carpet can hold on to some pretty nasty allergens and critters. Annoyed by how dirty hard wood floors can look? Well, all that dirt is in your carpet too, it’s just hidden. If someone in your family has problems with allergies, chemical sensitivities, or respiratory issues, replace carpet with hard surfaces, and vacuum area rugs often. I love my dog, and as hard as it is to say no to his admirably persistent attempts to get into our bed, he is rarely allowed in the bedroom. For me, it’s worth it for all the joy that pets bring, but dusting and vacuuming need to be much more frequent when you have furry babies. OK, so some of the ideas below require a little remodeling. Or it can just be treated as a room switch. This series has been about rethinking how we use our spaces and how they can used in nontraditional ways, in ways that work for the way you really live. Why not make your breakfast nook the one dining area? Do you really need two eating tables? Not only are you paying for the extra furniture, but a mortgage on that space too. If your mortgage is $2000 per month on a 2,000 sq foot house, and your dining room is 168 SF, you are paying over $2,000 per year for a room you may only use for major holidays and birthdays. One idea is to have the nice table in the breakfast nook. For everyday dining, use a table cloth (and table protector if you have young kiddos). Then, when you want to create a special dining experience, take off the table cloth, light some candles and turn down the lights. You won’t even notice that you’re in the breakfast nook that you use every day! If you have a breakfast bar or an area to place stools, this can serve as your casual dining area. The formal dining room is usually the perfect size for an extra bedroom or a guest room. Instead of moving to accommodate another child or because of the lack of a guest room, you can use the rarely used formal dining room. If you don’t want to get too much into the details, you can add some sliding doors, like those available from Raydoor or the Sliding Door Company, or DIY barn door sliders (where a track can be installed over the existing opening, so there is minimum disturbance). Then, when the kids are gone, the room can be converted back to a dining room or into a hobby room or office. 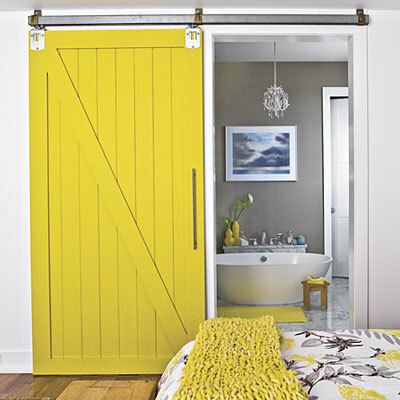 A sliding barn door is a great way to partition off a room (with an opening too big for a traditional door) without creating remodeling dust. Photo credit. Now to the possible remodeling part. The formal dining area is flexible because of its location at the front of the house, which opens up many possibilities for casual cohousing or house sharing. The formal area of a home can be turned into a separate room for an adult child or elderly parent. If the laundry room or a powder room are adjacent to the dining room, this opens up the opportunity to add a full bathroom. A separate entrance can be added to the front for renting out the room to a student. There is an opportunity for privacy in that the formal areas are usually separate from the other bedrooms. 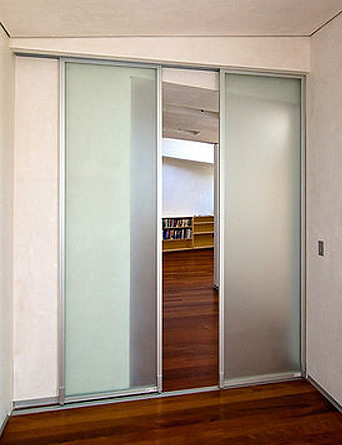 Use sliding doors to close off a home office or home office + foyer from the rest of the house. That way, the foyer can serve as an entrance for the office and the home. Photo: The Sliding Door Company. The location at the front of the house also makes it ideal for a home office. It can be closed off from the rest of the house. A separate entry can be added, or if the dining room is off of the foyer, sliding doors can be added to close off the foyer for when clients or business associates visit. If you have employees, the can make them more comfortable in that they will have some separation from your house. In many homes, the most common entry is the one adjacent to the garage or driveway, so the front door is not often used. Extra income can be added (not to mention company during the day) if the home office is turned into a community office for other work-from-homers in the neighborhood. Next week: Adaptable//Sustainable: Rethinking the living/dining room.